Emergency preparedness and response coordination is a multi-organisational effort, where a shared goal, that is, warning, evacuation and recovery, is heavily interdependent. When an extreme event occurs, professionals from multiple organisations must respond to the event by coordinating their respective knowledge, skills, and abilities to overcome problems generated by the crisis. This is a major challenge. A number of high-profile studies illustrate that coordination is often insufficient among responding government agencies, volunteers, businesses and humanitarian organisations. Effective coordination of the emergency response effort can be highly dependent upon the transfer, use, and quality of shared information about risks, vulnerabilities, and hazards among coordinating agencies. The traditional approaches to coordination largely delegated more authority to a single actor. The idea was to secure coordination by control from the top, a ‘coordination by command’ approach. This notion has been a contentious issue, mainly due to the difficulties in selecting a suitable governing body. Contemporary thinkers contend that it may be timely to consider whether an organisation should be reconceived as constituting a social network. 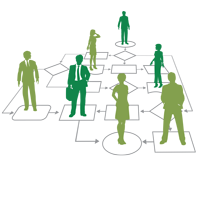 Hierarchical models of resource allocation and coordination emphasise the power and dependencies, which develop during interorganisational transactions. Research within resource dependency has also argued that there is a positive association between organisations’ network centrality and their supposed influence in community affairs. Significant failures during recent high profile crises have arisen as a consequence of rapidly changing circumstances on the ground, and as a consequence of the challenge of managing a dynamic situation across different response agencies that have distinct modes of operation. At the fundamental level, crisis response can be visualised as an interaction network with a flow of information between nodes, each of which represents an individual actor or agency. Observations of interaction networks in life, engineering and physical sciences suggest that the key functional properties of these networks are the flow of information they can support, the robustness of the flow to node failure, and the efficiency of the network which can be defined in terms of the time for information to pass between two points. Studies have shown that certain network designs perform better than others in each of these respects. Coordination is often insufficient among responding government agencies, volunteers, businesses and humanitarian organisations. Well-known assessment of some existing literature reaffirms the challenges of coordinating multi-organisational operations. However, there is limited systematic study evaluating the effect of the response coordination process and robustness on improving outcomes of these disaster-affected communities. In our research we are looking to combine biologically inspired network dynamics with social network analysis to provide a quantitative framework for the optimisation of emergency response networks during crisis events. The development of a quantitative tool for effective evaluation of the robustness of coordination using biological and social networks has not been attempted in theory, methods nor in practice, despite the fact that biologically-inspired networks have been successfully used to solve network-related problems in other disciplines such as IT. We would perform ego centric analysis for generating the relations reported by key individuals from the key emergency response coordinating agencies. Using ego centric analysis, we plan to explore how a sense of collective problem solving is maintained through different types of ties, whether strong or weak. In the social network parlance, the person we are interested in is referred to as the ‘ego’ and the people referred to by the ‘ego’ as his affiliate, adviser, friend, or relative, are known as ‘alters’. We plan to identify and understand the process of ad-hoc networks that emerged during a particular test case. This would help us also in understanding how the network comes into effect and its role and benefit for providing response coordination. We further want to investigate the role that information and communications technology played in helping the coordinating agencies in conducting rapid activation of the ad hoc social networks. Degree centrality, or degree, is one of basic measures of network centrality of social network analysis, which is defined by the number of direct links that a particular node has in the network. It highlights the node with the most links to other nodes in the network by reflection in having more direct contrast and adjacency than all other nodes in the network. Tie strength defines the quality of relationship between two actors in a network. The strength of relation between two actors can be expressed as a combination of the amount of time and the reciprocal services that characterise the tie between them. There is an increasing interest from not only Australia but also from the international communities with regard to robustness in coordinated response to disaster. Australia has an unusually complex system of governance, involving three levels of representative government and their associated public services; these include nine parliaments and hundreds of local government entities. This study is therefore particularly relevant to Australia’s need to mount fast, effective disaster response. At issue is how organisations such as ambulance services, local government support services, state health authorities, federal health agencies, Emergency Management Australia, the SES, the Department of Defence, and the Australian Quarantine Service interact in the response situation. The outcome of this emergency response coordination study will help us understand the present state of coordination among different agencies involved in preparing for and providing a response to regionally situated extreme events. The social network analysis of the agencies would serve as a basis for the effective design and reconstruction of emergency coordination structures. It should also provide mechanisms for successfully integrating different computer mediated communication tools for effective preparation and response coordination. Coordinating disaster assistance is critical for effective humanitarian aid operations, therefore Australian disaster management governing bodies can improve the understanding of issues related to inter-agency coordination during operations, both domestically and in terms of our foreign aid program. This is particularly important in the Asia-Pacific area, for which Australia bears strong responsibility in times of crisis. Organisations could benefit in increased understanding about how different micro and macro structural elements interact with each other to provide redundant or efficient coordination structure. A study of micro and macro structures could also suggest which specific type(s) of feedback system can be instrumental in generating different type(s) of performance outcome. Organisations may also benefit from using a complex network dynamics approach to identify their existing internal as well as external coordination patterns. This could lead to improved understanding about the existing structure, which provides an optimal level of efficiency and effectiveness in responding to projects that are dynamic and adaptive in nature. —With Professor John Crawford, who holds the Judith and David Coffey Chair in Sustainable Agriculture at The University of Sydney. Associate Professor Liaquat Hossain is the director of the Project Management Graduate Program and Sub Dean for Postgraduate Studies of the Faculty of Engineering and IT at the University of Sydney. Liaquat Hossain has written 1 articles for us.